We've been compiling some amazing Porsche models on eBay for over two years now, and we've seen some pretty astonishing cars pop up now and again. We recently started publishing our picks once a week instead of our prior bi-weekly schedule, in an effort to bring you more exciting Porsche auction action. Check back often for different cars! This week we have a good diversity of selections. An oddball replica built on the back of an old 993 is our highlight of the week, but it's backed up by a hotrod 964, a rare 991, a rare 911 Cabriolet project-car starter, and a rare 964. Keep in mind, some of these cars could be great collection investments, while others might prove to do more financial harm than good. If you're looking for a Porsche that can carve canyons as well as look good in your driveway, this cream 964 might be the one you want. With a full H&R adjustable suspension, thicker sway bars, and some sticky Falken tires, as well as a intake/exhaust/tune power addition kit. This could be a nice little hot rod for your weekend trips to the mountains or easily an occasional commuter. It's beautiful, it's well sorted. I'm not sure it's worth the asking price, but it's pretty cool. You can check out the full build list in the description. This one doesn't look like much, but it could be the start you need for an amazing project. The M541 "Turbo Look" package is incredibly rare, and this shell is one of the ever rarer Turbo Look Cabriolets. I've only ever seen one of these Porsches in my lifetime, and when done properly, they are quite beautiful. While not quite as rare as a 930 Cab proper, the seller's "only 141 built and sent to North America in 1988" statement is probably pretty close to accurate. This Porsche clearly has some issues, but with the right builder could be an excellent occasional driver hot-rod 911. I've always thought the 964 Carrera RS America was overvalued by the market. Aside from rarity, there is nothing about this 911 that really screams "special" to me. Yes, it's a cool car, but is it worth four or five times as much as a Carrera 2? I'd argue not. In any case, this Porshe is pretty highly desirable, as it it optioned to the max as a 1994 with sunroof, stereo, and air conditioning options. It's pretty, and it's neat. If you need a nice low-mileage high-option 964 RS America, this one might be the one you want. At $150,000 I can think of a bunch of other things I'd rather have, though. If you want to talk about rare, just take a look at this Rennsport Reunion special edition Carrera GTS. There were only 25 of these built, and I've not seen one for sale. It was announced by Porsche almost a year ago to the day last year at Rennsport. They're all painted in gorgeous Fashion Grey with special wheels, special lights, special graphics, and interior bits. It's unlikely you'll see another one for sale any time soon. That said, with a $290,000 asking price, you may see this one for sale for quite a while. This is a really odd piece of the Porsche puzzle, as it is visually similar to a very exciting race car, but it is built on what is possibly the least interesting iteration of the 993 generation. Staring with a 993 Targa Tiptronic 3.6 Carrera 2, this madman built a quasi 993 GT1 looking street machine. There are no shots of the car from below, but it doesn't appear that the wheelbase was appreciably stretched. I'm guessing this is still a stock 993 underneath with some decent looking fiberglass bits grafted on, meaning it's still rear-engined instead of the GT1's mid-engine architecture. One only needs to check out the interior to see an example of hasty and shoddy worksmanship, but if this thing were actually done properly, it could be a really neat machine. One thing is for certain, it needs at least another 200 horsepower to back up those visuals. 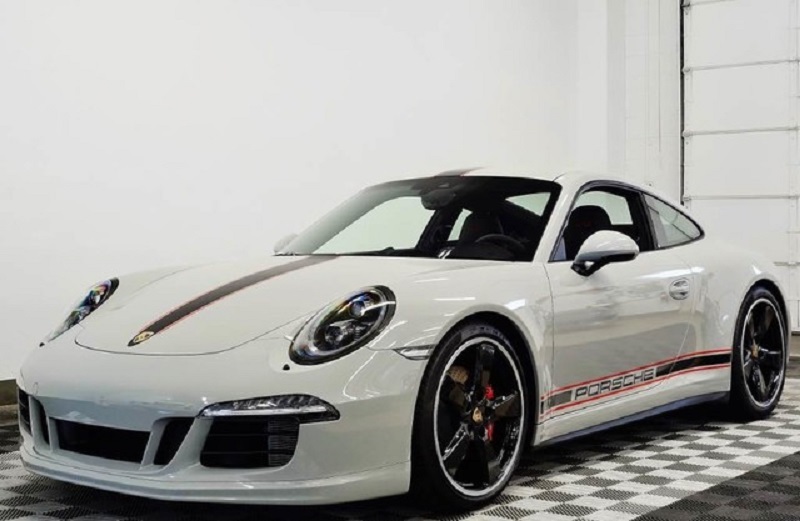 The rennsport sold, but Isringhausen Porsche has one! Where did you see that it sold? We just saw the auction end, but it doesn’t show it as sold. Did it sell offline?